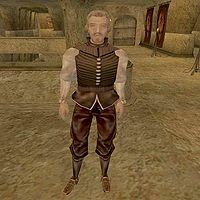 Marcel Maurard is a Breton acrobat located outside the enchanter in the Lower Waistworks, Vivec, Foreign Quarter. An aspiring actor, he is looking for his big break. Maurard wears a common shirt with matching pants and shoes. He possesses a small amount of gold. Aside from his natural resistance to disease, and the ability to command animals, he knows no spells. The Bad Actor: Get rid of an annoying fool looking for a troupe. This page was last modified on 24 January 2018, at 22:57.